view of down town GR, originally uploaded by bbmarie. 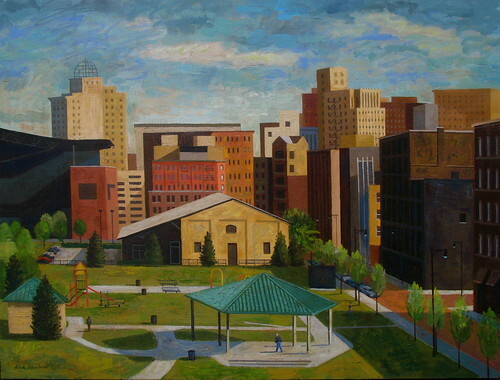 This painting was done for Calvin College as a commission. I really enjoyed doing this piece as it is coming out of a long study of this particular view. I think every time I paint the city I love it a little bit more. I can't help but wonder what GR wants to grow into and how can I be apart of it? The painting does not represent what is there in an exact way. Things got pushed around and exaggerated. I did use my camera on this one along with a ton of drawings and a oil sketch to create the image. If anyone out there is thinking of commissioning a painting don't put it off, contact me and lets talk. I love a good commission because it takes me beyond my own little world.